Yupo is a unique synthetic paper that is ideal for use with Alcohol Inks, Mixed Media, Watercolours and Acrylics. Its smooth surface enables wet media to be wiped from the surface to reveal white underneath; colour can also be scratched from the surface once dry. Watch your paints and inks interact in all sorts of unusual ways on this fantastic surface! Suitable for artists of all abilities, and great for those who are looking to experiment with fluid media. 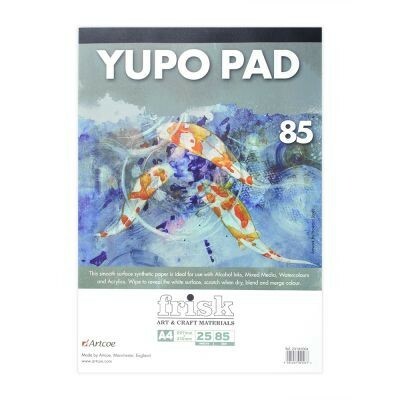 Each pad contains 25 sheets of White 85gsm Yupo paper gummed at one end. Now available in A4 and A3 sizes.